T. Pearson, S. Brown, A. Parveen and N. Moore. 2006. 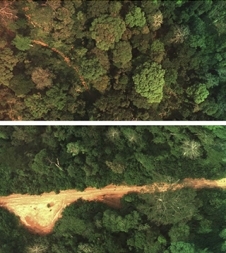 Use of Aerial Digital Imagery to Measure the Impact of Selective Logging on Carbon Stocks of Tropical Forests in the Republic of Congo: Deliverable 9: Aerial Imagery Analysis of Logging Damage. Winrock International, Report submitted to USAID. Cooperative Agreement No. EEM-A-00-03-00006-00.